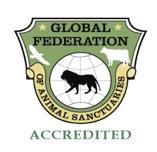 These two links will show you which Sanctuaries are accredited with American Sanctuary Association and Global Federation of Animal Sanctuaries. GFAS Accredited Sanctuary. Humane and responsible care of the animals has been confirmed by onsite visits by trained inspector(s), and the nonprofit meets the definition of a true sanctuary. In addition to meeting these requirements for verification as a true sanctuary, the facility has additionally achieved Adequate Performance or higher in each of the following areas after a thorough examination against strict criteria, as required for accreditation status: governance, finance, guidelines, education and outreach, staffing, physical facilities, security/safety, and the veterinary medical program. GFAS Verified Sanctuary. Humane and responsible care of the animals has been confirmed by on an onsite visit by a trained inspector. In addition, the sanctuary meets the definition of a true sanctuary: the facility has nonprofit status, all required licenses and permits, does not engage in commercial trade (with some exceptions allowed such as the purchase of animals who might otherwise end up in slaughter), allows no or restricted contact with the public, only inpidual welfare-centric research is allowed, and no intentional breeding of animals occurs, with sound practices in place to prevent propagation. Note that both Accredited and Verified Sanctuaries provide humane and responsible care of the animals, as confirmed by an onsite visit. A “verified” status as opposed to an “accredited” status often reflects constrictions imposed by financial resources. Hello, I am thinking of putting my parrot in a sanctuary that is not accredited with the organizations you mention. How can I make certain this is a wise choice? Also, can my hand fed african grey adjust and be happier with other parrots? Thank you for your help, the name of the place is: Florida Exotic Bird Sanctuary. First off you need to look at the longevity of the facility you are considering. Have they been around for years or only just opened in the past few years? What kinds of plans do they have in place to assure that your feathered one will be able to continue living there forever. Any legitimate place will also have a board of directors and they should not be family members. They should have a board certified avain vet and their vetting records should be available for you to view. You want to see that all birds are getting annual checkups and of course any medical care needed. Do they have a quarantine area for new or sick birds? They should have detailed records on every bird in their care. There should be some sort of financial backing and not just living off of charitable donations. They should also have limits set on how many birds they can take in of each species. There should be open aviaries for each species so that they are not just caged all the time. Think of it as if you were considering this place for your child, what would you want and expect…it should be the same for our birds as well 🙂 Hope this helps and if you have any further questions you can contact one of the accredited sanctuaries and ask them questions, they are always more than willing to help. Thank you for replying. My concern is that things aren’t always as they seem and I can’t imagine why a sanctuary would not have certification. We are going to speak with someone from this sanctuary and ask the question and then decide if we should pursue the possibility. I have located another closer to our home which is certified. Perhaps another way of asking the question is how difficult is it to become certified? Is this the gold standard? Again, thank you for your help, Deborah, our parrot is our child!